As shown it is transmitting (using the central rear waveguide port) vertical polarisation. It is receiving horizontal polarisation via the receive-band-pass/transmit-reject filter in the side arm. If the entire assembly were rotated 180 deg so the side arm was downwards it would be still vertical transmit and horizontal receive. If the unit is tipped on its side, to either side, so the arm sticks out at the side, the receive polarisation would be vertical and transmit horizontal. The four alternative positions, at the top, bottom, left or right sides are STARTING positions to be used prior to making the polarisation angle adjustment, which depends on site location and satellite orbit longitude. 2. Unusual co polarisation feed assembly shown on the right. As shown below it is both transmitting and receiving horizontal polarisation. Receive 10.95 - 12.75 GHz and Transmit 13.75 - 14.5 GHz. The side arm filter passes the receive frequencies so the LNB needs attaching at the side arm. 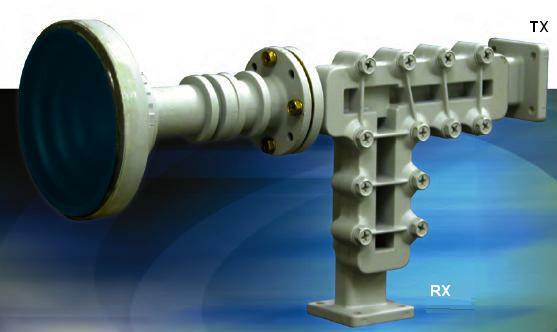 The rear, in-line, waveguide has a filter that passes the transmit frequencies, so attach the transmitter (BUC) here. 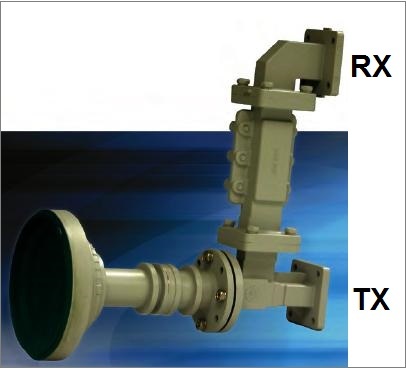 It is important, as connecting the transmitter to the wrong one may damage both the transmit BUC and possibly the LNB.